This cycling holiday takes you to so many fascinating places in such a short time, and with no challenging hills or distances. You'll discover and taste the real France - its rich history, unspoilt villages, vineyards, wines and traditional cuisine. Plus the enormous satisfaction of having cycled to the Mediterranean. 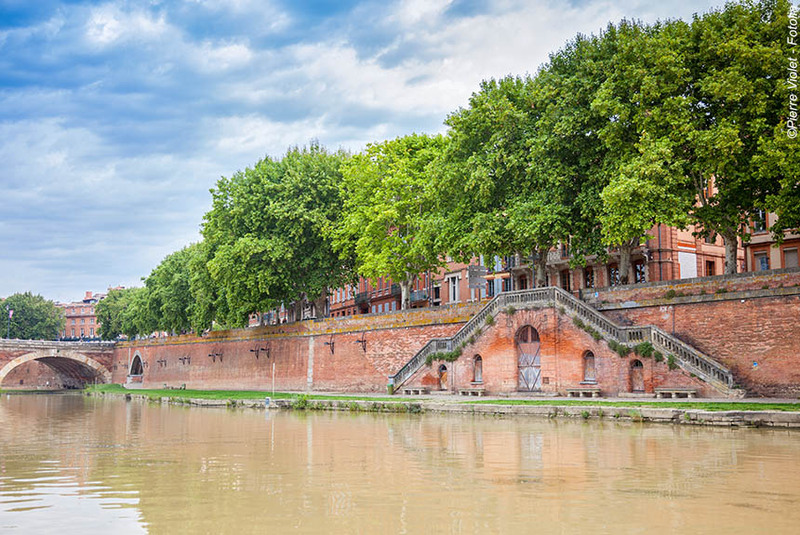 You begin in the vibrant Pink City of Toulouse before gently cycling along the banks of the Canal du Midi discovering villages and churches, castles and vineyards as you go. One highlight will undoubtedly be the marvellously preserved walled city of Caracassonne, but you may well enjoy other, lesser known places just as much. You will cycle along the Mediterranean coast to complete your journey in the historic fishing port of Sète. A truly memorable short break that will appeal to those who already love cycling as well as those who may not be quite so sure ! Standard option: You make your own way to your first night's hotel in Toulouse. With extra airport pick-up: We can pick you up from Toulouse airport or train station and take you to your first hotel. Pick-ups from other airports are also available (please consult us for prices). Toulouse is known as The Pink City - a wonderfully vibrant, artistic and historic city that is a joy to wander around. Your bikes will be waiting for you at the hotel. Electric bikes are a pre-book option (see price list), but we feel that they are not really necessary on this almost entirely flat journey. You stay at the three star Hôtel Grand Orléans, superbly located off the Capitole with well equipped, quiet rooms, on a bed and breakfast basis, leaving you free to choose the restaurant that most appeals to your tastes. 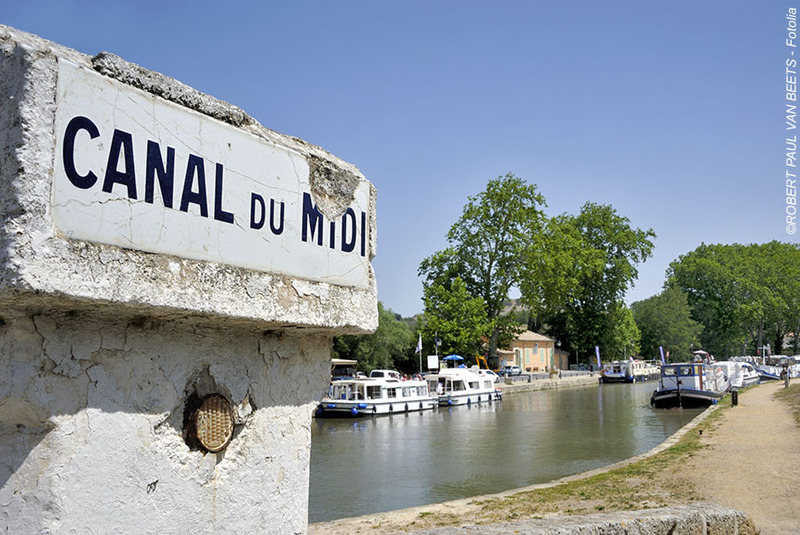 You start from Paul Riquet bridge named after the man who supervised the canal's construction when it began in 1666, and soon you are rolling along right beside the canal through delightful open country accompanied by numerous péniches, the ubiquitous boats of the Canal du Midi. 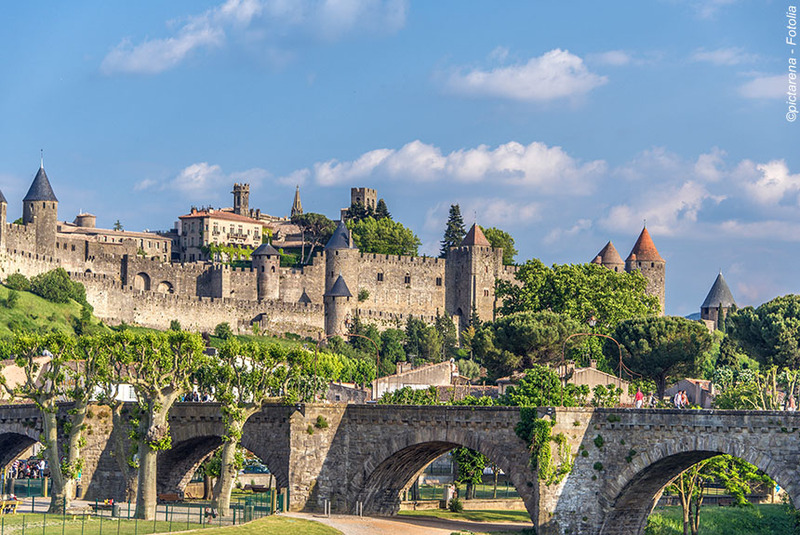 Your first stop is Avignonet made famous by Cathar tragedies, and today renowned for its medieval houses, sculptures and huge churches that make it well worth an hour or so's visit. 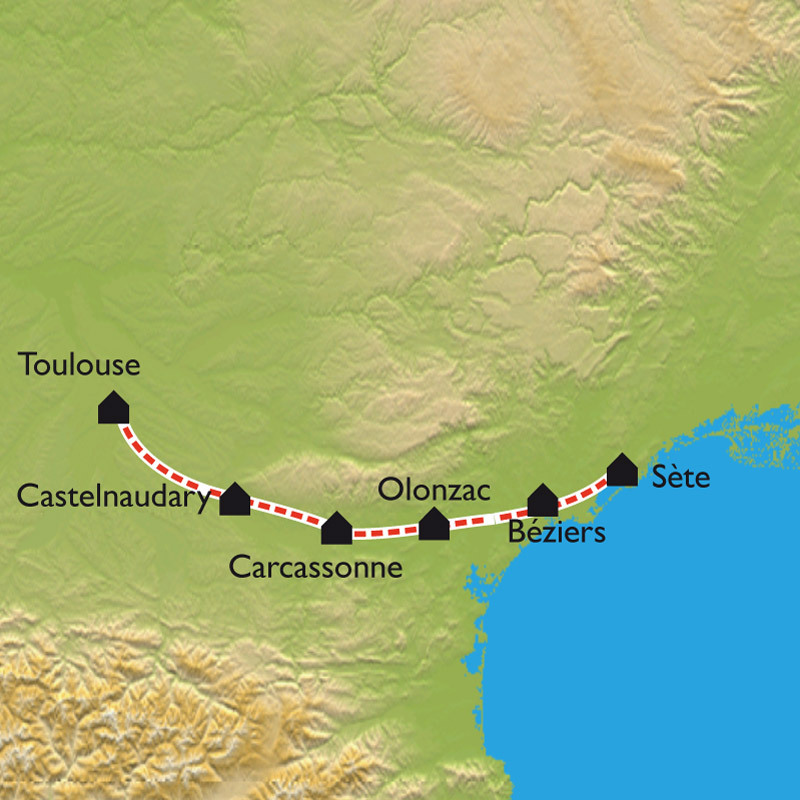 You pass close to several villages along the way, but the next significant location, at the foot of the Black Mountains, is the Seuil de Narouze, which is the highest point of the whole Deux Mers (two seas) canal at 600 feet, and is the point that divides waters flowing into the Atlantic one way and the Mediterranean the other, so it is downhill all the way from here - literally! - and certainly to your destination for the day, Castelnaudary, famous for its cassoulet. You stay at the comfortable, modern three star Hôtel Clos Fleuri in Castelnaudary with its pleasant outdoor terrace, very welcome swimming pool, smart restaurant (dinner included), and all a stroll from the town itself. Today is truly a journey through, and to, history. You pass several two thousand year old villages, but the jewel is undoubtedly Bram, founded in the 2nd century BC and once named Eboromagnus when it became an important trading city, but today it is best known as being the best preserved circular town in Europe. Then there are 17th century places relating to the canal itself, including the fascinating double lock at Lalande, the windmill at Cugarel, the grand basin at Villepinte, and the 4 way aquaduct at Rebenty. Finally, Carcassonne itself, probably the best preserved large scale walled city in Europe and, of course, a UNESCO world heritage site. A medieval city like no other, and there is no better way to discover it than by staying right beside the walls. The three star Hôtel Aragon is a very comfortable, well appointed hotel with swimming pool, and, just as importantly, is 50 yards from the main gate into the city - the best of both worlds. You stay on a bed and breakfast basis leaving you free to choose a restaurant inside the great walls of the city. You leave the city alongside the canal, and appreciate the shade from those plane trees that so characteristically line the route. You can choose to visit what most interests you whether it be the 12th century church at Trebes guarded by 320 crows carved in oak, Marseillette, an ancient Gaul village, or Capendu with its Romanesque chapel. Alternatively, you can sit and read in village cafes, and picnic tranquilly on the banks of the canal. You are in the heart of southern France, and the ambiance is almost tangible. Just being here is a huge pleasure, and on a bike you can reach the parts most tourists never reach. The nearer to your destination in Olonzac you get, the more fields of grapes dominate the landscape and the economy of the region. If nothing else, it promises interesting local wines tonight. You stay and dine at the characterfully homely Maison d'hôtes Eloi Merle - a real taste of France, but there is a heated swimming pool, jacuzzi and plenty of space to lounge peacefully. You pass the Argens lock, then follow the canal as it snakes towards a major four way canal crossorads. You take the Canal de la Robine en route to the Mediterranean and Beziers, but do stop at the wonderful 12th to 15th century Capestang Cathedral that dominates the landscape. as you can best see by climbing the bell tower. There are many remains of Roman occupation - a lost 5,000 feet long Roman bridge over the marshes, the Gallo-Roman village of Poilhes la Romaine, and the oppidum (hill town) of Ensérune, which was continuously occupied from the 6th century BC to the 1st century AD. Then there are canal related discoveries: the 500 foot 17th century Malpas tunnel - secretly dug in 8 days against government wishes, and the first canal tunnel in Europe - and the 9 technologically advanced locks at Foncérannes. 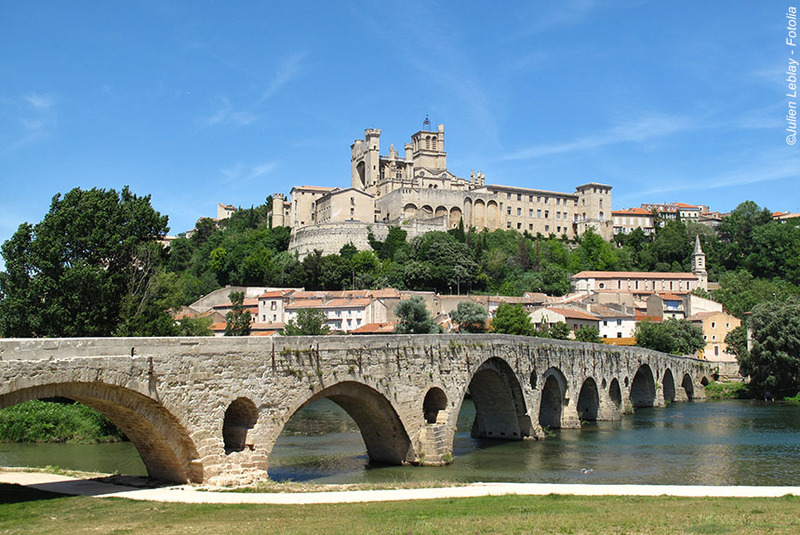 All unfolding before you arrive in Beziers to explore its historic streets, its cathedral, and its Pont-Vieux - all too often ignored, it's others' loss and your gain. The three star Hôtel Imperator occupies a magnificent building right in the heart of historic Beziers with atmospheric public and bed rooms as well as a lovely private terrace. The best place to stay in Beziers where you are free to discover the restaurant that suits you best - there are plenty to choose from. In Beziers you feel you are within touching distance of the Mediterranean - and indeed you almost are as you set out on this final morning seeing a mosaic of sand dunes, wetlands and salt lagoons. It is a landscape almost indistinguishable from the nearby Camargue, not least with its egrets, wild horses and bulls, but you stay true to the canal passing the impressive round lock at Agde before cycling through the city - do visit the cathedral and historic quarter - and rejoining the canal soon which runs beside the huge Thau etang (lake or, in this case, lagoon), then the Bagnas etang before finally arriving right beside the Mediterranean beaches of Marseillan. 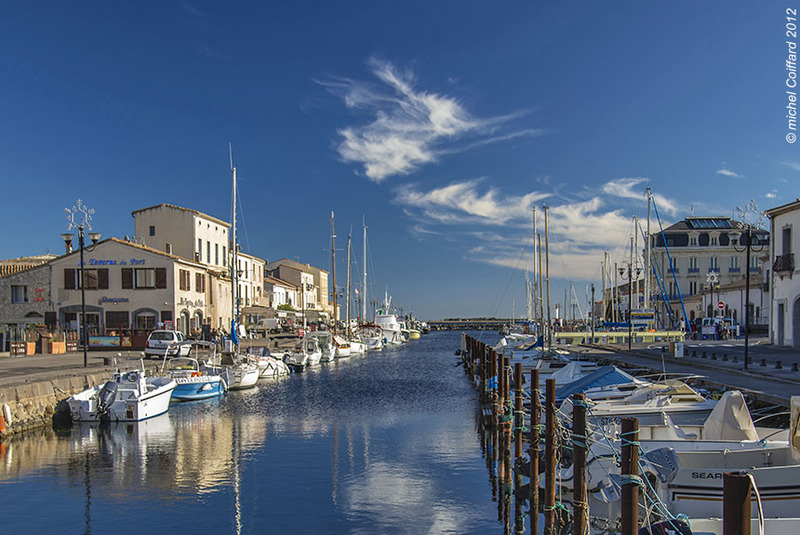 You now cycle beside the sea all the way into the historic port of Sete. A truly memorable journey! You stay for your final night at the rightly named three star Hôtel Grand, superbly located in the town centre overlooking the harbour, and retaining all its original 19th elegance, while delivering all the contemporary comforts of the 21st century. Dinner is included in its stylish restaurant, but, unfortunately, not the bubbly you might be celebrating with! Standard option: After breakfast, you leave your bikes here and make your own way onwards. With extra airport pick-up: After breakfast, you leave your bikes here before being picked up for a transfer to Montpellier airport or train station. Transfers to other airports are also available (please consult us for prices). 1 April to 30 October. This is an easy cyling holiday almost entirely on the flat. Electric bikes are available for a supplement, but we don't think they add much to this particular holiday. Your luggage is transported daily to the next hotel, so all you need is a day sack. This is an independent, self-guided holiday, although we provide comprehensive itinerary information. You stay in five 3 star hotels, and quality one maison d'hotes. Three nights are on a dinner, bed and breakfast basis (nights 2, 4, 6), and the others on a bed and breakfast basis. In the month preceding your holiday (and after the totality of your trip has been paid for), you will be sent a travel folder containing all the necessary documents for the completion of your holiday: a practical information sheet (giving you your meeting times, transfers, accommodation contact numbers and addresses etc), detailed route descriptions and itinerary, maps (sometimes integrated into the route descriptions), necessary documents (your invoice, hotel vouchers if required etc), and luggage tags. 1 travel bag per person (or suitcase with wheels). Make sure they are not too big in order to avoid logistical problems (taking up too much room in transfer vehicles, for example). On holidays where you move from one hotel to another during your stay, try to keep the weight down to 10-12kg (the extra weight can make it difficult to get all the suitcases to certain hotels that are difficult to get to). Be certain not to leave any fragile or valuable objects in your main luggage. 1 rucksack (around 30-40 litres) with integrated water-bag (e.g. Camel-Back). These bags are more practical than carrying bottles. The rucksack should also have a waist belt and allow your back to be well ventilated for extra comfort. Keep the total weight of your rucksack plus belongings down to a maximum of 10kg. 1 warmer layer (a fleece or water-resistant "softshell"jacket). Or a "primaloft" jacket (warm and easily compacted down to fit into rucksacks). 1 waterproof bag containing: travel insurance contract, ID or passport, health card, and all other documents mentioned in the "formalities" section. You should try to be self-sufficient for all minor cycling breakdowns typical of these kinds of cycling tours (tyre-lever, puncture repair kit, multi-tool, quick-fix chain link...). If you have disk-brakes or high-tech bikes, be sure to bring the necessary kit for repairs. Three nights dinner, bed and breakfast (nights 2, 4, 6), and the other nights on a bed and breakfast basis; transport of your luggage each day; your bike (non-electric); comprehensive itinerary information and directions including all the maps you will need; 24/7 English speaking customer service. Transfers to your first night's hotel or back from your last night's (unless specified in the option you have chosen), hotel; drinks with dinners; entry fees; additional transfers; electric bikes; picnics (buy locally or ask the hotel the night before - pay locally); dinners on the first, third and fifth nights; personal insurance. "You can enjoy walking independently in the Pyrenees anytime between April and early November – but not everywhere. However, you can enjoy cycling independently in the Pyrenees anytime between April and early November almost anywhere." All our cycling holidays "From the Atlantic to the Mediterranean"